CES 2019 was a white-knuckle roller-coaster of a ride, with some game-changing technology already here and more on the horizon. Here are my top 10 takeaways from the press days, the keynotes, and the time I spent with the exhibitors and innovators on the show floor. Of course, it’s impossible to see everything. The show, which drew more than 180,000 attendees from more than 155 countries, stretched across the Las Vegas Convention Center and ten hotels. The 4,500 exhibitors brought technology from every conceivable product category from 3D printing to wireless. CES, which kicked off in New York in 1967 with 250 exhibitors and 17,500 attendees has become an annual pilgrimage for the electronics industry. More than letting folks know what’s happening now, CES is a venue that gives attendees a glimpse into the future. Some of the hottest topics included 5G, artificial intelligence, automated assistants, and autonomous vehicles. Organizations are grappling with how to leverage rather than simply contain the data that they have and how to connect with other organizations to create world class partnerships that shape the industry. The show also provided ample opportunity to redefine innovation, resiliency and other buzzwords to shape how the industry will look in the future. Click on the image below to start a slideshow of the highlights of CES. Just as a footnote I wanted to add how every year I am blown away by how much research and development effort goes in to mimicking some of the everyday tasks that we take for granted and do so skillfully, they’re not even close! Let’s hear it for humanity, we are truly awesome, complex, and beautiful! When mains electricity was first introduced, it was spotty and unreliable. Now, we don’t talk about it as a technology or even as a variable, it’s a given. 5G with its ultra-high-speeds, bandwidth and low latency promises the same for connectivity, making mission critical communications possible between just about everything. This kind of connectivity is the essence, the life blood of the Internet of Things, of Smart Cities, of connected medicine and of autonomous driving. Cellular Vehicle to Everything (C-V2X) communications is the enabler that will likely accelerate the adoption of driverless vehicles. 5G connectivity will enable 8K streaming and virtual and augmented Reality (VR/AR) entertainment and gaming. And 5G could well revolutionize the way supply chains and manufacturing ecosystems are connected and managed. Few were more excited and animated about 5G than Verizon CEO, Hans Vestberg in his keynote address. AI was a huge topic last year at CES, but, boy, has it moved on in the last 12 months. Numerous projects and solutions have been developed and tested and the results are both promising and a little scary. AI’s ability to make informed decisions on our behalf has led to its extensive use in retail, in medical diagnosis, and in just about every other part of our lives. Many believe we are coming to a crossroads when we must decide just how much of our lives we are prepared to hand over to these learning algorithms. Narrow AI, as it is called, is the ability to learn a single task and learn it well, no matter how complex and large the variables and data. We already have this and it is being deployed successfully. Broad AI will take on multiple tasks, add reasoning and scalability and learn faster with less data. The final nirvana is general AI, which is much closer to how humans think. Everyone agrees this is a long way off. Voice activated personal assistants are really getting busy in our lives, managing our smart homes, helping us make purchases and giving us the information we want when we need it. Most seem to believe the role of these personal assistants, that now make extensive use of AI, will grow substantially. Just about every gadget now boasts Alexa built in or an Alexa interface. In fact, some level of voice activated support is becoming table stakes for consumer technology. Every industry is excited about the ability of these assistants to create a frictionless interface between the smart devices in our lives, and we can expect to seamlessly continue our dialogue with Alexa, or any of her friends, like Siri, Bixby, or Google, whether we’re home, in the car, in the office or shopping at the mall. Car makers were among the many at CES announcing technology partnerships to bring Alexa just about everywhere. According to Ginni Rometty, IBM President, Chairman and CEO, in her keynote, data is the world’s greatest and most valuable natural resource. I’ve said before that data is the new fuel for our future and apparently, we are generating 2.5 trillion bytes every day. Less than 1 percent of that is collected and utilized and the remaining data, deep data as some call it, will be where additional value is mined in the future. For example, IBM used a fingernail sensor to collect data that can provide early diagnosis of Alzheimer’s and Parkinson’s. The data that can be crowdsourced from devices, like barometric from smartphones and inflight data from aircraft can all be used to make weather predictions more accurately and timely. The age of data is here and thanks to connectivity and computing power, it can be utilized to derive all kinds of benefits. The data age is an accelerator for what many people already call the augmented age. Our ability to augment ourselves has been around for some time, from the invention of the bicycle to augment our ability to move around. Now augmentation is taking on a whole new meaning beyond the physical and into the mental. Many complex tasks are already being augmented by machinery and computers, resulting is faster decision making, better outcomes and much more. For example, in medicine where a surgeon can use both VR and AR to overlay 3D images of the inside of a patient’s skull before conducting complex critical surgery or where an AI system can quickly learn how to diagnose disease as if it had seen the cases of thousands of practitioners. Harmony between man and machine and a learning partnership, where both play the role of teacher and pupil, seems the only good outcome for the adoption of many technologies. As is now the norm, the automotive industry was front and center throughout CES. The amount of technology in a vehicle is a real game changer for the car industry and everyone is getting excited about the opportunities around multi-modal mobility and the opportunities smart cites provide those who are part of the ecosystem. Whilst driverless vehicles remain the end game, there are dozens of technologies along the way that seek to augment the driver, providing a safer more pleasant commute each day. Byton actually refer to their new vehicle as a smart device on wheels, with its touch pad and 48” monitor. Yes, that’s a four-foot-wide screen in a production, not concept, car available later this year. But it wasn’t just the car makers and their suppliers making waves about ADAS (Automated Driver Assisted Systems). Qualcomm announced a snapdragon processor and ecosystem specifically for the automotive sector, Samsung announced Bixby would be an in car as well as smart home assistant, and numerous other tech/auto partnership were announced. Don’t you just love it when a large corporation talks about an entrepreneurial mentality, where innovation runs free and people think like startups? I know I do, and I know I smile when I hear it. Startups are unique, not just in the way they think, but also in the way they behave and the pressures they are under. Can a large corporate really simulate that kind of intense creativity and drive? At CES, innovation in every form is alive and well and the startup world sits cheek by jowl with some of the world’s largest brands and technology players. More than 1,200 startups found their way to Eureka Park in the Las Vegas Sand Convention Center this year, alongside dozens of companies there to support them in bringing their ideas to market. Multiple groups from all over the world were present with France bringing more startups form overseas than any other nation for the second year in succession. One of the sectors having its own agenda and activity this year is resilience technology. This is technology that makes the world more resilient to the threats of political unrest, natural disasters, terrorism, climate change, cyber-attacks and just about any other risk you can imagine. The role of resilience tech is to monitor, detect, prepare, respond, repair and mitigate the impact of all these potential dangers. Resilience technologies include early warning systems, such as monitoring devices, weather detection and prediction AI algorithms, such as flood warnings, and early response systems, like drones to deliver medicines into hard to reach locations. This is a sector of huge importance as we move towards a more connected and so-called smarter world, driven by AI and fueled by data. Nowadays no press event is complete without the announcement of a new partnership and every keynote included a guest CEO from a company in close collaboration. I’d like to think that the spirit of Las Vegas has created a kind of ‘love potion number nine’ that makes everyone want to share and get along harmoniously. Truth is most companies have realized that many industries are colliding and that success comes from multiple skills. It’s no longer enough to have singular domain knowledge, now you need to fuse that with data skills, customization, augmentation, platform development and much more. So, partnerships are everywhere and expect many more. The ability to play nicely in a collaborative situation is now a key executive skill. Managing partnerships at the highest level and integrating technologies are highly valued abilities. 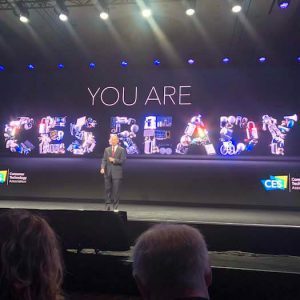 These are the words written in foot-high letter behind Consumer Technology Association (CTA) CEO, Gary Shapiro, during his opening address to the thousands crammed in to the Sand Ballroom. Governments need to decide if they are trying to assist technology developments and trade or they are trying to get in the way. Many, including me, see the drive for dominance of some of these ingredient technologies, like AI, as the new space race. But few, and certainly not me, believe that tariffs provide a solution. They are blunt instruments at best, and at worst damage the industries and people they seek to protect. Administrations would be well served to look at the countries scoring highly on the CTA’s Innovation Scorecard, which highlights the nations who best foster creativity and innovation. Those countries have the greatest level of freedom and flexible and open trade policies.